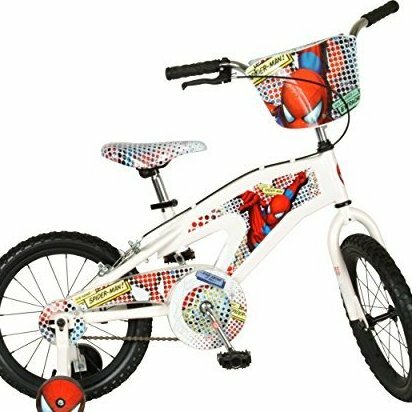 Spider-Man-themed 16-inch BMX bike with heavy-duty steel frame. Pneumatic 16-inch knobby tires with secure training wheels. Rear coaster and hand brakes; fully enclosed chain guard. Measures 40 x 36 x 24 inches (W x H x D); weighs 29 pounds. Recommended for ages 2 to 5.